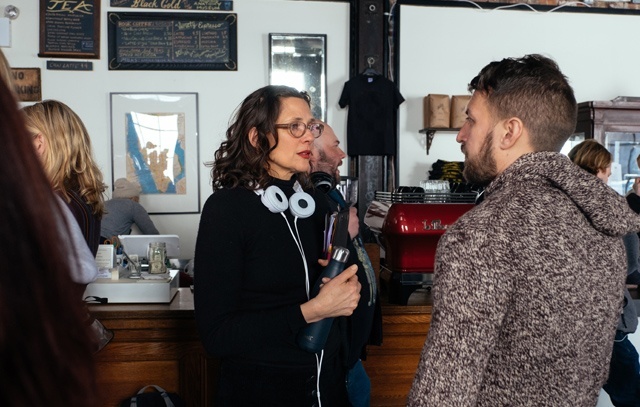 In the first segment, Rebecca Miller whose new feature, "Maggie's Plan", opens on May 20th. Maggie's (Greta Gerwig) plan to have a baby on her own is derailed when she falls in love with a married man, destroying his marriage. However, after the birth of her daughter she begins to suspect that he was with the right woman all along. Terence Davies with his film, "Sunset Song", which opens Friday, May 13th. At the dawning of the Great War, a young daughter of a farmer endures the hardships of rural Scottish life as she comes of age, based on the novel by Lewis Grassic Gibbon. The music on this episode is by Jim's Big Ego from their album Stay.